Suomy Helmet’s are designed and manufactured in compliance with the highest qualitative standards specifically for motorcycle use. 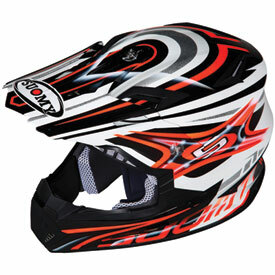 The Suomy Rumble Motorcycle Helmet is certified by the most important Certification Bodies. The Rumble Motorcycle Helmet has a removable internal shell which has been ergonomically designed for a uniform and controlled fit of the entire head. The visible aeration slots ensure that incoming air thermo-regulates the inside of the Suomy Rumble Motorcycle Helmet and that the flow of hot air is easily discharged for the rear. DVRC Channeled EPS Liner for maximum air flow with minimal weight. Removable/washable liner and cheek pads allows custom fit. Functional intake and exhaust venting keeps the rider cool. Race approved by every major U.S. race organization! Great bang for the buck helmet. The helmet I bought (on closeout) had a build date of 2014. I ordered this helmet on 2018. The fit and finish is generally good. No issues, the foam an liner could be of higher quality - but decent for the price. I generally wear M in Arai, but for Suomy, I had to go L. The adjustable visor is a nice bonus, as is the quality of the paint. Looks good, fits good. Not very heavy at all. For the sale price of 100 dollars it’s hard to beat that value. Does this helmet have a mount for a camera like go pro? BEST ANSWER: No. No helmet has a built in camera mount. How much does this helmet weigh?